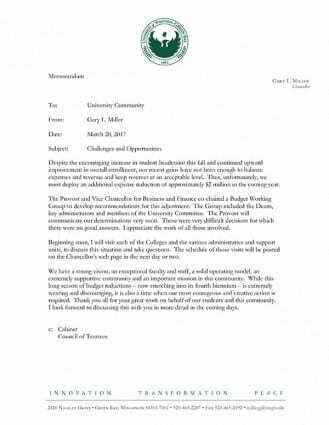 The UW-Green Bay office of the Chancellor forwarded UW System President Ray Cross’s message regarding the budget to faculty, staff and students on Monday, May 8, 2017. Last week, the Wisconsin Legislature’s Joint Finance Committee (JFC) began voting on the 2017-19 biennial budget. 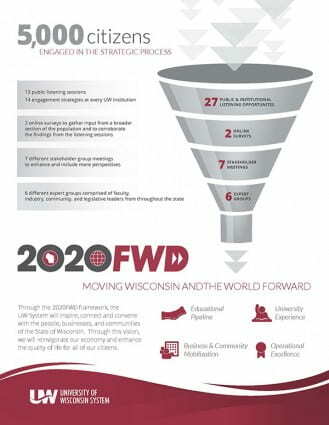 I would like to share with you several highlights of the UW System budget request as we expect JFC will vote on our provisions mid-to-late May. We put forth a reasonable budget request totaling $42.5 million, which aligns our resources with the state’s greatest needs as identified by more than 5,000 citizens, students, business and community leaders, faculty and families in our listening sessions around the state. The request included an increase of $19 million in additional financial aid through the Wisconsin Grant program so that all students in need are served. The Board also passed a plan that freezes tuition in year one allows for an increase of no more than inflation in year two. Our faculty and staff work incredibly hard – and our institutions compete for talent at a national and international level. UW System asked for a compensation increase of 2% in each year of the biennium. We are also working with the legislature to ensure the UW System remains part of the compensation reserve so that our staff get the same pay increases as other state employees in future budgets. To best serve our students, the UW System needs to be able to continue to attract and retain talented faculty. We are working with the administration and legislature to refine the formula and metrics associated with outcomes-based funding. While often referred to as performance-based funding, I agree with members of the Joint Finance Committee who believe we should focus on investing in, measuring, and rewarding outcomes rather than inputs. Metrics should be measurable, have value to the state, and protect our commitment to a comprehensive and quality college experience. We need appropriate teaching and living spaces for our faculty and students, and we continue to advocate for our capital budget, which renovates, remodels and maintains our existing buildings. The maintenance plan we submitted affects about 3% of our existing inventory – and renovates only 1.6% of our gross square footage. Project costs go up when delayed, and if we can make the necessary repairs now, it will save taxpayers and students millions of dollars in the future. Projects at UW-Milwaukee and UW-Extension have already received formal support, and UW-Platteville, UW-Parkside, and UW-Madison may be added to the list in the future. The UW System will receive new state dollars for the first time in nearly a decade. 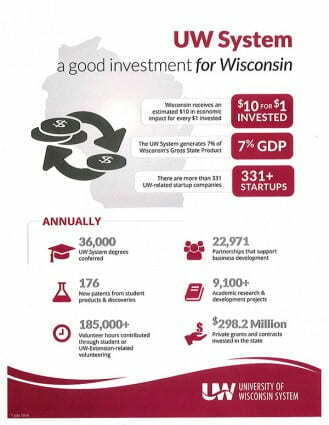 This demonstrates an appreciation for the value and economic impact UW System brings to Wisconsin. Historically, Wisconsin has received at least $10 in economic impact for every $1 of State funding invested in UW System. 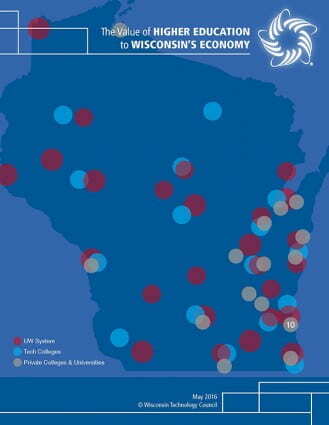 Conservatively, the UW System’s impact to Wisconsin’s economy is $15+ billion each year. 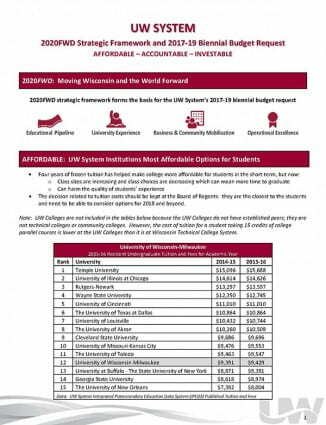 Both the UW System’s budget request and the Governor’s budget proposal focus on college affordability and accountability. While some of the tactics are different, we are heading down the same path. Our message throughout this budget has been consistent and clear: now is time to invest in the UW. We are actively working to ensure the UW System’s final budget supports our mission of being an affordable, top tier public university system. 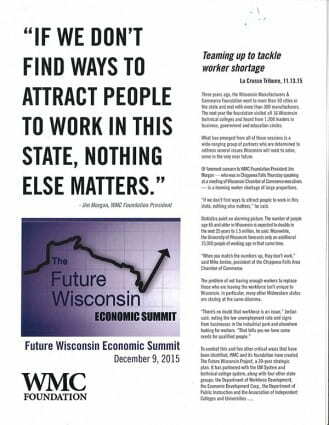 We must provide solutions for our state’s unique problems, while driving economic prosperity for all of our citizens. By working together with stakeholders across our institutions, I am confident that our best and brightest days as a System lay ahead. Thank you for your help and support in this endeavor. Good luck with your finals, congratulations to all those who are graduating this month, and enjoy the upcoming summer! The UW-Green Bay Office of the Chancellor e-mailed the following memorandum from Chancellor Miller to faculty and staff on Monday, March 20, 2017. 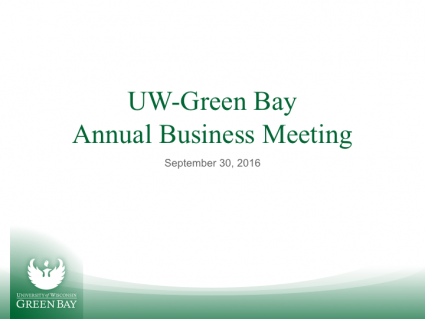 Campus leadership hosted a UW-Green Bay Annual Business Meeting, on September 30, 2016. UW-Green Bay Chancellor Gary Miller, Vice Chancellor for Business and Finance Sheryl Van Gruensven and Provost and Vice Chancellor for Academic Affairs Greg Davis provided an update on the state of the University. The agenda included an overview of the 2017-2019 biennial budget process, what it holds for UW-Green Bay and the ongoing work to advocate for the University. Also provided was an update on UWGB’s current budget, fund balances and overall financial health going into the new academic year. The presentation also highlighted enrollment progress and the correlation between enrollment and the University budgeting process and gave an update on recent expenditure reduction efforts. Each of the two presentation sessions closed with a question and answer session. Video of the presentation will be available this week. The presentation file (pdf) is available for download. 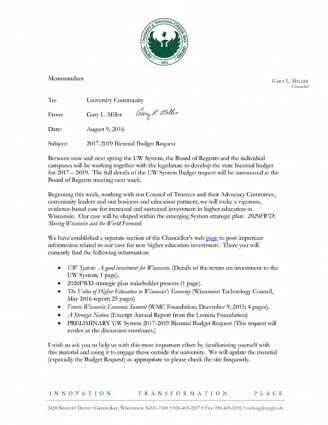 The UW-Green Bay Office of the Chancellor e-mailed the following 2017-19 Biennial Budget Request memorandum from Chancellor Miller to faculty and staff on Tuesday, August 9, 2016. The memorandum includes a link to 2017-19 UW System Budget Information, a page containing documents relevant to the argument for new investment into higher education. 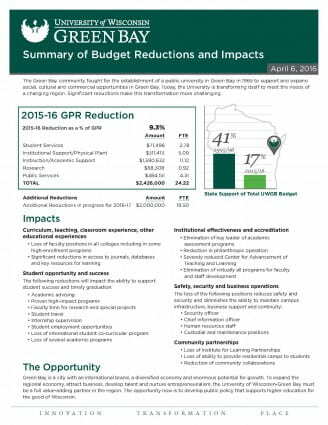 Available below are documents containing important information related to UW-Green Bay’s case for new higher education investment. 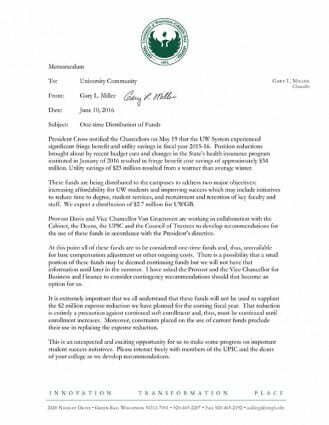 Friday, June 10, 2016 the UW-Green Bay Office of the Chancellor e-mailed the following memorandum from Chancellor Miller to faculty and staff regarding available one-time funds from the UW System.